FitThumb is a Highly Customizable and Engaging Employee Wellness Portal. Corporate wellness programs, customized team fitness challenges, incentives and rewards, dashboards and more. FitThumb is an online, web-based wellness platform that provides your employees fun and engaging fitness challenges, online education, exercise and nutrition tracking, health coaching tools, social features, points, rewards, program management and more! Our clients range from small 20 person businesses to Fortune 500 companies. Fitthumb is a customizable and cost effective, integrated wellness platform that helps you administer your corporate wellness program. Request a demo to find out what we can do for you! It be customized to your Corporate Wellness Program, to your individual and team challenges or whitelabel requirements. Individual, Group, Team and Weight loss challenges. Wellness challenges, nutrition and life classes. Email digests and articles. Employees and Spouses. Configurable incentive stores. Group rewards. Reporting and management features. Dashboards are a convenient way to organize and present your wellness program. List your programs, utilize point caps, ask for proof and more. Health coaching organizations and consultants can use our numerous tools for managing your coaching population. FitThumb services not only companies but can also be whitelabeled and used as a platform for brokers and consultants who need a well rounded wellness and health coaching platform to help deliver their services. Leave the technology to us! Providing direct to company wellness portals is our specialty! If you're in need of putting your wellness program into an easy to use platform and would like to know how we can help you stay organized and engaging, schedule a demo today! Brokers or Health Plan partners provide health coaching services to their book of business. We can partner with you to provide a branded white label solution complete with health coaching tools. We love short term team challenges! 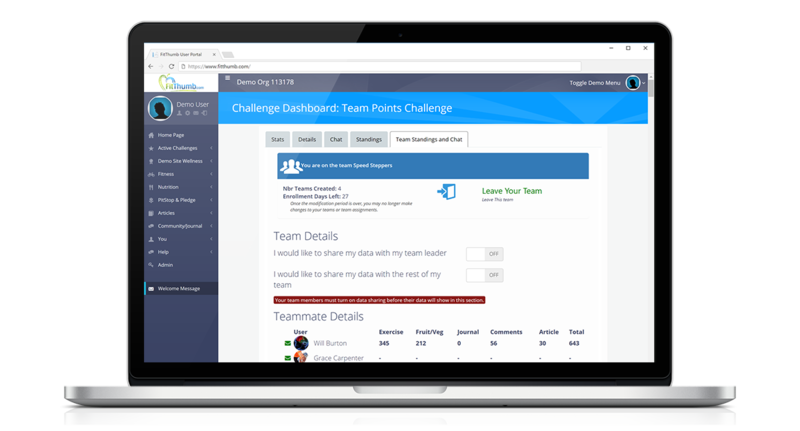 We provide team-based challenge functionality to a variety of clients in all business sectors. We turn on the portal for the duration of the challenge (Typically 6-10 weeks) and then shut it down after. Click Here for more information. FitThumb is the most user and admin-friendly worksite wellness platform that I have ever used. I can't say enough wonderful things about how this platform has allowed us to grow our wellness program. Fitthumb has been an easy website for both myself and my clients to navigate. There are too many features to name but I love how the technology allows me to sync fitness trackers and automatically uploads everything. The site has allowed me to be so much more productive at my job! FitThumb's communication tools, classes, structure and challenges have helped improve employee participation in our wellness program. From roll-out to maintenance, they have been open to our requests and concerns, ideas and suggestions, and addressed any issues we have in a timely matter. I highly recommend them! The new portal looks great and is user friendly! Good job! ; Staff are already logging into, using, and loving the new OU Fit portal. ; This looks really good! New portal and program is great! This website has been instrumental in helping us automate our wellness program, making it easier and more efficient for our employees to participate. With all new programs comes a learning curve, but fitthumb is quick to respond and assist with any issues. It has been a pleasure working with them to implement our new wellness program. Lori - Oriana House, Inc. I've been absolutely thrilled to hear some of our employees' success stories through this program – we've had people tell us they can play with their grandchildren for the first time. FitThumb is a great company to work with. Their customer service is top notch and the capabilities of the platform are endless. We have really enjoyed partnering with Fithumb on our wellness needs. FitThumb has helped me grow and expand my client base in the online wellness market. They are a critical foundation of my core business practices allowing our coaching team to seamless provide feedback and guidance for company employees.